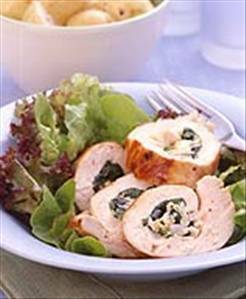 Truly delicious spinach, onion and feta stuffed chicken breasts. In a large non-stick skillet, heat olive oil; sauté onion until golden, 5 minutes. Wilt spinach (steam or heat damp in pan); stir in lemon zest, feta, salt and pepper. Set aside. Divide spinach mixture between chicken breast cutlets. Roll up and secure with toothpicks. In same skillet, heat remaining oil over medium-high heat. Cook chicken, turning occasionally until golden brown and cooked through, about 10 minutes. 2937 members have added this recipe to their cookbook. I added a clove of crushed garlic to the spinach mixture - without it, it would have been bland. Entire family (including kids) LOVED this recipe. Easy and yummy! I love this recipe. It is delicious for dieters and non-dieters! Calories are definetly wrong. 376 in 8 oz chick, 40 in the oil, 90in the feta, 506 total not counting the veggies. One serving at least 253 calories. Still a good choice, but this is my first recipe look and now I have no confidence in the nutritional data here. I would eliminate the salt, too much for one meal. I made this the other night and it was fantastic. I recommended it to a few friends and everyone said how delish it was. WE do a thing in my family, "repeat or reject" this def got a repeat! looks yummy, will try this recipe over the weekend. Do you think this recipe is good for The South Beach Diet, Phase 2? There are 191 calories in 1 serving of Spinach Stuffed Chicken Breast. Calorie break-down: 29% fat, 11% carbs, 60% protein. 35 other members have added this recipe to their cookbook for The South Beach Diet, Phase 2.